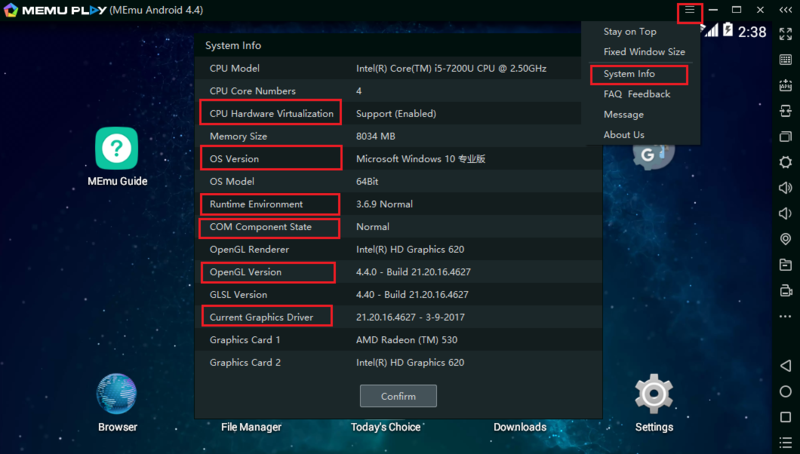 If you get stuck when launching MEmu, check system requirement first, and then check below solutions. or Windows OS crash or power failure make your MEmu disk image broken. or Anti-virus software like AVAST blocks a certain file in MEmu by mistake. or Installation process is not fully completed due to restricted environment or anti-virus software. Your graphic card device or your graphic card driver is out-of-date. Hardware virtualization (VT) is not enabled or Conflict with 3rd-party software. You have installed too many apps/games or your hardware virtualization (VT) is not enabled or supported or your hardware spec is too low. or Windows OS crash or power failure make some data file in MEmu VM broken. Your anti-virus software like Kaspersky blocks Android boot-up. Inter-process deadlock due to network socket. Note: Please report to us if your start failure is not included or well addressed. Note: Please check system info by clicking the button at top right corner.